RBTH presents a selection of views from leading Russian media on international events, featuring analysis of the Dec. 14 meeting between U.S. Secretary of State John Kerry and Russian Foreign Minister Sergei Lavrov in Rome and the implications of the Ukraine Freedom Support Act, along with a preview of the upcoming meeting between NATO Secretary General Jens Stoltenberg and Ukrainian Prime Minister Arseniy Yatsenyuk. 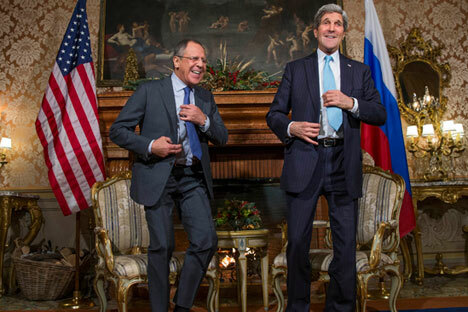 The Kommersant business daily sums up the outcomes of the Dec. 14 meeting in Rome between U.S. Secretary of State John Kerry and Russian Foreign Minister Sergei Lavrov. This latest round of talks between the two ministers was one of the most difficult, the paper points out. Since their previous meeting in Basel on Dec. 4, several important events have taken place, Kommersant continues. The escalation of the Palestinian-Israeli conflict and the upcoming discussion of a future Palestinian state at the UN Security Council has pushed the situation in the Middle East to the top of the agenda. “Middle East issues require an urgent solution. Together, we must make sure that the situation does not deteriorate,” the paper quotes Lavrov as saying. In addition to the situation in the Middle East, urgent talks were necessitated by the obstacles hindering the resumption of peace negotiations on the conflict in the Donbass region of eastern Ukraine. A new meeting of the contact group on Ukraine that was due to take place in Minsk last week to discuss the cessation of hostilities never took place, putting the continuation of the whole Minsk process in jeopardy, Kommersant writes. Furthermore, earlier the U.S. Congress passed the Ukraine Freedom Support Act, a bill that authorizes the provision of military aid to Ukraine and new sanctions against Russia. Alexander Lukashevich, official spokesman for the Russian Foreign Ministry, described the bill as “a powerful time bomb under bilateral relations” that was “comparable to the notorious Jackson–Vanik amendment [of 1974],” the paper adds. The influential business daily Vedomosti also writes about the Ukraine Freedom Support Act. Under the provisions of the bill, President Barack Obama can allocate $350 million for military assistance to Kiev. He can also introduce sanctions against Gazprom if the Russian gas giant reduces gas supplies to NATO countries, Ukraine, Georgia, or Moldova. If Russia sends weapons to the territory of another country “without the authorization of its internationally recognized government,” the United States can impose sanctions against Russian state arms exporter Rosoboronexport. This concerns Moscow’s military cooperation with Georgia’s breakaway regions of Abkhazia and South Ossetia and the deployment of armaments in Crimea, the paper explains. In addition, the bill makes it possible to restrict investment by foreign companies into Russian energy sector projects. Vedomosti points out that the original wording of the act proposed granting Ukraine, Georgia, and Moldova the status of the United States’ “major non-NATO allies,” however, the adopted version does not contain this provision. Nevertheless, the bill still envisages supplying the Ukrainian army with anti-tank weapons, artillery radar and ammunition, the paper adds. However, experts polled by Vedomosti do not believe that Barack Obama will use the received authorization to introduce new sanctions against Russia. Alexei Arbatov, head of the International Security Center at the Russian Academy of Sciences’ Institute of World Economy and International Relations, told the paper that this bill can be viewed as an act of provocation by Congress. Although Obama will not use his right of veto, he will not follow the recommendations since his administration does not support this bill, Arbatov said. “This is yet another political demarche and there is no military threat to Russia,” he added. The centrist Nezavisimaya Gazeta newspaper previews the upcoming meeting between NATO Secretary General Jens Stoltenberg and Ukrainian Prime Minister Arseniy Yatsenyuk, which is due to discuss ways of deepening cooperation between Kiev and the alliance. The paper points out that this week the Ukrainian parliament, the Verkhovna Rada, plans to cancel the country’s non-aligned status and to resume its drive to secure Ukraine’s membership of NATO. Deputies intend to make amendments to dozens of laws and state programs as well as to the country’s Domestic and Foreign Policy Concept. NATO intends to provide Kiev with consultative and organizational assistance in this. In addition, individual NATO member states may supply weapons and military hardware to Ukraine. Late last week, both the Senate and the House of Representatives voted for bills in support of Ukraine. The legislation envisages primarily economic and energy assistance: The U.S. will continue to allocate funds for programs whose implementation will make it possible to reduce Ukraine’s dependence on Russia, the paper points out. Military experts and political analysts speculate on how the vote at the Ukrainian parliament will affect Russia’s actions. The current phase in Kiev’s rapprochement with the alliance and the prospect of securing the status of strategic non-NATO ally to the U.S. may result in a further deterioration in Ukrainian-Russian relations, some pundits polled by the newspaper predict. According to them, this phase could transform the hybrid war in the Donbass into a full-fledged and large-scale military confrontation.